Many younger consumers might not even be aware that there's an app on their phone for "calling". Phones have come a long way since the days a person had to hold the ear piece in one hand and talk into a speaker on the box when making a call. In today's mobile phone market, games and apps are taking precedent even over texting and the iPhone has staked its claim as the leader of the pack. It turns out that playing games on a mobile phone isn't just a young person's world anymore. In a study of 12,000 smart phone users of all ages, results showed that a whopping 85 percent of iPhone owners have played games on the device. That's a staggering statistic even considering that 75 percent of Android users also used their smartphones for gaming. While 85 percent of iPhone users reported using their device for gaming, that could very well mean they used it once just to see what all the fuss was about. For a deeper look that same study also lent credence to the fact that the iPhone was ruling the mobile gaming world as it detailed time spent playing the games. Using a mobile Arbitron device that captures data, reports showed that iPhone users averaged around 743 gaming minutes per month compared to 484 for Android owners. 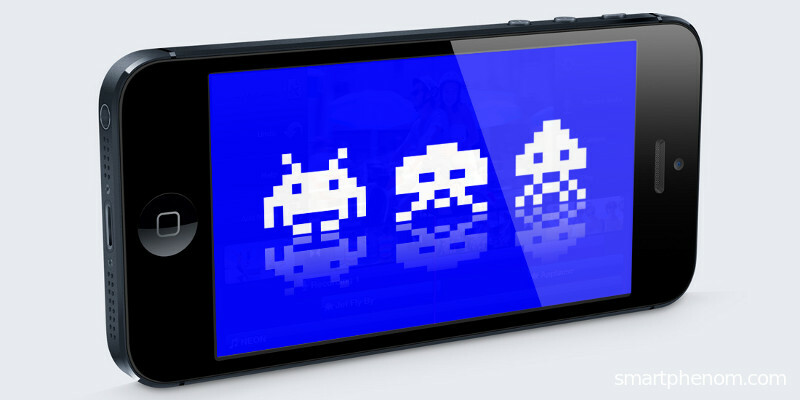 The overall popularity of smartphones is one of the main reasons that mobile gaming has seen such a rise in its usage. There was once a time when just having a cell phone gave a person the appearance of being cool and connected but now many people are embarrassed to even talk in public if they aren't using an iPhone or an Android device. Since these smart phones offer people the ability to do everything from the palm of their hand – surf the web, get caught up on social media, text friends, view the weather – many people are on them the majority of the day. The truth is, there are only so many times a person can check their Facebook feed in a given day so they get bored. Mobile gaming is a great way to waste time in between classes, while waiting for the bus, on a lunch break, etc. Popularity - There is some significance in owning an iPhone; that is a fact that it can't be discounted. The iPhone was released in 2007 and is now looking at entering its 5th Generation of development phase. While consumers rush out to spend $600 on the newest iPhone, previous generations can be had for around $100 through some retailers. Basically, owning an iPhone has never been less expensive. Uniformity – Unlike in Android devices in which games and apps available are totally dependent on the smartphone carrier such as Samsung or HTC, in the iPhones Apple dictates the content and it is universal in all phones via the iTunes shop. People are familiar with these games after playing them on their iPod Touch or iPad and once the title is purchased it can be transferred in up to five devices. Cost – There is separate coding procedures to play a game on an iPhone compared to an Android device and developers must choose which platform to write their game in. Since the iPhone is surging in popularity, most choose to use the Objective – C software. Also, since mobile gaming apps are such competitive industry iPhone software developers must offer their product at the lowest price possible to stand out from the pack. Take into account there is no packaging or shipping costs and you'll find that most quality games are available for fewer than ten dollars. As iPhone's are becoming less expensive, user numbers are expected to surge which will lead to them having a stranglehold on the mobile gaming industry. As with anything, competition is healthy and Android carriers are showing no sign of throwing in the towel...and Microsoft and their Windows Phone might have something to say about the matter as well. Author: This article is being written by Jason Phillips. He is a game designer and has designed many online games. Also he is a co editor at the site Tom and Jerry Games 365.